Designed with substantial support for heavier sleepers, the Titan pairs two layers of the highest quality foam with heavy duty, premium coils—delivering extra lift and extra durability for the life of your mattress. • A 1” layer of quilted, gel memory foam resists body impressions and provides optimal cooling comfort while you sleep. • A 2” layer of patented TitanFlex™ foam delivers responsive contouring with targeted pressure point relief. • A 6” core of up to 1,024 individually encased TitanCaliber™ coils provides industrial support, coupled with superior motion isolation. • A 2” high density foam base adds durability to the mattress while reinforcing individually encased coils as they compress. Is Titan the right bed for you? 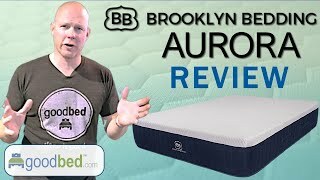 Do you have a Brooklyn Titan mattress? Write a Review! There are no reviews on GoodBed for the Titan yet. Be the first. Have a question about the Titan? The Titan is a tight top spring core firm mattress model released in 2018 that is manufactured by Brooklyn Bedding. Have an update or correction to our information about Brooklyn Titan? If so, please take a moment to suggest an edit. Titan mattresses sold by Brooklyn Bedding come with a 120-night in-home trial. Brooklyn Titan mattresses are only available online or through Brooklyn Bedding stores. Click here to check for a location near you.